There’s always that one dude in school who seems to have it all: good looks, athletic ability and a cool girlfriend. For MTV Shuga Down South ‘that dude’ is Q. Assuming the role of the prince of Zenzele comes with responsibilities. Or at least that’s how Q sees it. Maintaining a ‘macho’ rep amongst his friends is one of the requirements Q holds dear. Q and Reggie have been best friends since childhood; however, when Reggie makes a personal revelation to Q about his sexuality, Q is very unsupportive and turns his back on Reggie. Will Q see the errors in his ways and be able to make it up to Reggie? Jezriel Skei has been reaching international audiences since a young age. Playing ‘Q’ in MTV Shuga: Down South is sure to spread his reach even further. 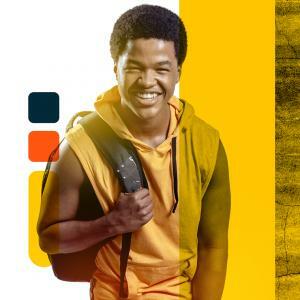 Jezriel’s role in the critically-acclaimed ‘Four Corners’ landed him the SAFTA award for Best Actor in a Feature Film, making him the youngest South African actor to collect the prize. Attending the National School of Arts has allowed Jezirel to finesse his acting skills even further.